Daylilies (Hemerocallis) species have been used for cooking for centuries. The Chinese have used all parts of the daylily to eat. The dried spent blossoms are the primary parts used in cooking. 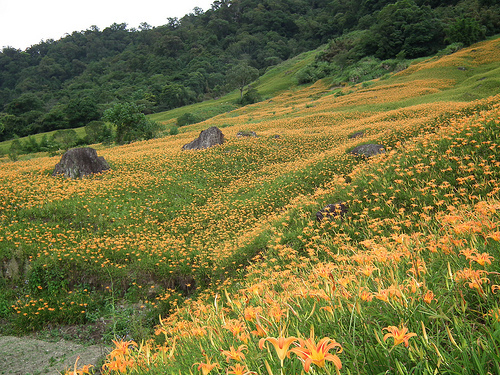 In China (Taiwan) there are acres of daylilies grown for cooking. The great diversity of daylily cultivars probably means that there is a large untapped resource of potential daylily cooking attributes to be discovered. Note though that daylily buds can result in gastric distress in some people. It is possible too that there are daylily varieties that may be easily digestible for everyone. the milder yellow varieties) and either sun-dry them or use a dehydrator. They may also be found in oriental markets. To use them, soak the dried flowers in hot water about ten minutes. Then pinch off the stem end, and cut in half if large. They add a chewy texture and are rich in carotene. be used in place of any of the vegetables. heat and cook until vegetables are done but crisp. Add rice, egg and soy sauce to taste, and mix until heated through. Serves 4 as a side dish or 2 as an entree. There are a number of daylily farms in Taiwan. The flowers and possibly the buds are harvested for food. Hualien County i Taiwan is well known for its large daylily fields. Liushidan Mountain(Sixty Stone Mountain) is located to the east of Zhutian Village, Fuli Township, in Hualien County. It is situated at an elevation of around 800 meters above sea level, in the Coastal Mountain Range. 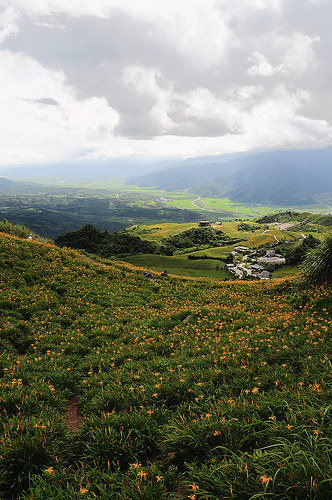 There is a daylily field of 300 hectares in size, and along with Chihke Mountain, this is regarded as one of Hualien County’s two large daylily cultivation areas.